I like cars a lot. Here are some from my past and present. 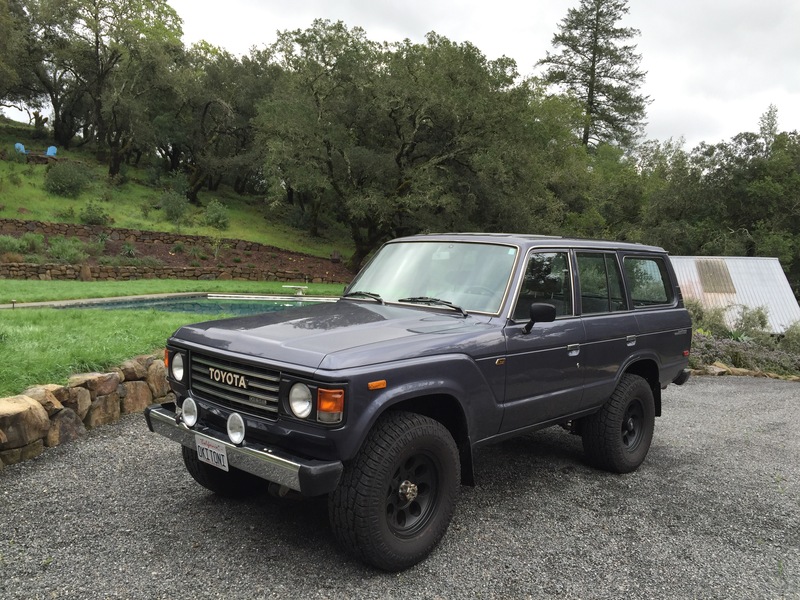 A 1985 BJ60 Landcruiser, my daily driver for the last 12 years. A fun, strong truck that runs on biodiesel, just passed 300k miles, and is getting a new engine (that should get 30 mpg). A 1969 Lancia Fulvia HF Fanalone. My dad bought this car new in Italy and used to race it in Switzerland. We used to drive it over mountain passes and to the Geneva car show when I was a kid, so it represents a part of my childhood that I still get to enjoy as an adult. More photos here and a mention here. Ben’s first car, a 1993 Volvo Wagon with a surprisingly hard to find manual transmission. 250k miles and still going, we recently picked it up in Oregon and drove it home along the coast. It’s a rare combination of being fun, practical, and classic. We took this VW Van on a long and leisurely drive across the US and back with the kids in the summer of ’08 – what a great trip! Here we slept in it overnight near the Badlands in South Dakota. My former daily driver. Great for beach outings and hauling kids, bikes and servers. A mid-80s Caterham Super 7. Very fun and very fast, pretty reliable after a bunch of work, though I never got all of the electrical gremlins figured out. A 76 Ferrari 308 GTB that used to be my dad’s. Everyone has a car they regret selling – this one is mine. The “family Gurgel”, I painted it red (used to be army green) and learned to drive in it. It’s from Brazil and may be the most fun vehicle I’ve ever driven. A 63 Ford Falcon, my first car purchase ($800), bought in LA when I moved to California. The Falcon was “upgraded” to a 64 Volvo 544. One of my all-time favorite car designs. My experiment in car exporting (I shipped these from California to Switzerland). Made a little money, but more importantly I got to drive each one for a while. A Maserati Quattroporte. Wins the awards for best sound and best freeway cruising. Also shipped to Switzerland. Diane and I got this 77 Cutlass Supreme on a whim and liked it so much that we used to fight over who got to drive it. The Saab. Diane’s car when we first met. She drove and loved it for over 10 years. The M3. My treat after selling our first startup. Had great fun racing it at Sears Point, then we had kids and I had less fun getting car seats in and out of the back. Toni, ref, to the red Gurgel, would you happen to have pictures of the vw chassis.I'm currently fitting the same type body on a VW chassis, but I'm missing the measurement between the front suspension beam and the "firewall". Would you be interested in buying a 1976 Peugeot 504 in new condition. I am a senior and will retire in a senior complex where there is no room for a car. The blue Healey takes me back. My dad had one exactly like that as part of his 'mid-life crisis', I just thought it was the smartest thing in the world to be delivered at school in an open top sports car with an exhaust note that wake the dead. I drove a Caterham a couple of years back and it reminded me of the Healey a bit, but mostly of being on board an impossibly manoeuverable X-wing Starfighter. Great fun at a track day, and designed to go round any shape corner as though it wasn't there. Wonderful. I know (the old) Hockenheim: when did your dad drive there? Love the 308. I own one albeit not Fibreglass but they are ammazing to drive. Drove through CH and A and felt very James Bond mixed with the Persuaders. Did you buy it pre-fitted out, or do it yourself? Any details on how the inside is fitted out? Links on where to find out more, etc? I'm digging the M3. All that needs is a custom racing rim set and you're good to go. Would like to chat with you about the 308 GTB pictured on your blog. Can you e-mail me back? Of all of them, I'd choose the Lancia Fulvia. I've always loved the headlight/grill layout of that car. Gurgel: Once when the clutch cable broke we had to start at red lights like a bobsleigh team, pushing until Toni crash-engaged the second gear and we could jump in. Fond memories of the days when we where young.